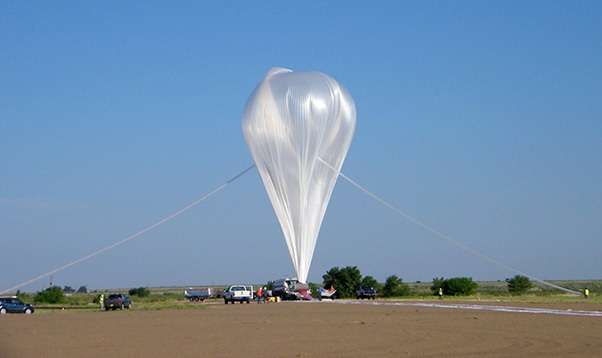 The “Big 60,” NASA’s largest scientific balloon was launched from Fort Sumner, N.M., on Aug. 17, 2018. NASA successfully launched a football stadium-sized scientific balloon, dubbed the “Big 60,” on Aug. 17, from Fort Sumner, N.M., for the first time in more than 15 years. 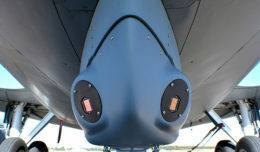 A second test flight was conducted Aug. 25. The 60-million-cubic-foot balloon floated to a record-breaking sustainable altitude of 159,000 feet on Aug. 17, allowing the payload and three ride-along experiments to fly for about 8 hours. The Big 60 is NASA’s largest zero pressure balloon to date. If all of the polyethylene material were spread out on the ground, it would be enough to cover about 20 acres of land. The larger size allows the balloon to float about 5 miles higher than any other zero pressure balloon — that’s about 20 Empire State Buildings closer to the edge of space than NASA’s next largest balloon. In addition to its larger size, the Big 60 is also half as thick as the other balloons that NASA flies. At 0.0004 inches wide, the plastic film covering the balloon is a little less than the thickness of kitchen plastic wrap. These films go through three stages of testing before they are flight ready, including a round of quality control testing at Wallops Flight Facility’s Balloon Research and Development Lab. The balloon floats in Earth’s stratosphere, where temperatures average around minus 76 degrees Fahrenheit, but the films are rated to withstand temperatures as low as minus 130 degrees in the lab. Because the Big 60 design is still in its testing phase, the gondola primarily contained support instrumentation, such as tracking, video and telemetry, with some tertiary experiments flying to round out the 1,650-pound suspended payload. Sarah Fischer, a technologist in the Wallops Balloon Research and Development Lab, said the Big 60 can lift a payload the weight of a small four-wheeler, but also had room for a few smaller missions. “It’s like saying I have room for three shoeboxes on board my go-kart,” said Fischer. The shoebox-sized experiments include two student payloads participating in NASA’s University Student Instrument Project and a larger experiment from the University of Arizona testing a new type of antenna for interplanetary CubeSats. 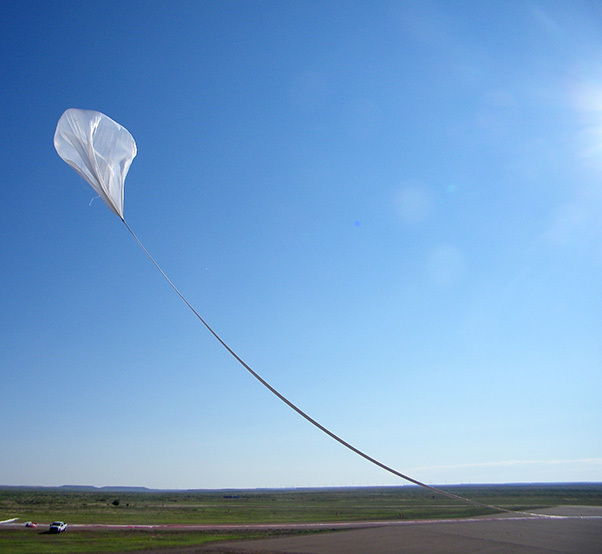 The Big 60 zero pressure balloon flew for a total of eight hours following its launch from Fort Sumner, N.M., on Aug. 17, 2018. 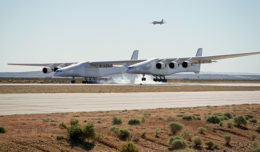 This test flight evaluated the Big 60’s overall design and ability to carry science missions, but future test flights will go a step further and also allow researchers to test new instruments. Soaring to great heights doesn’t come without sacrifices. In order to float to a higher altitude, the Big 60 lifts only about a quarter of the weight of the workhorse 40-million-cubic-foot zero pressure balloon. However, Fischer said that even though the Big 60 lifts lighter payloads, the higher altitude will enable new science investigations on balloons. Nine missions are scheduled during the 2018 fall campaign from Fort Sumner. In addition to the Big 60 flights, the Harvard University Stratospheric Chemistry Experiment flew Aug. 24 through the NASA Undergraduate Student Instrument Project. According to Fischer, Fort Sumner makes an ideal launch site for balloons primarily for its geography. She explained that it’s easy to ship supplies and bring in experimenters compared to other launch sites, and allows the balloon to fly on a trajectory that avoids high population centers. The August flight was Big 60’s first since 2002. A total of eight balloons will fly in the 2018 fall campaign, including two test flights of the Big 60. * Faint Intergalactic Redshifted Emission Balloon (FIREBALL): Searches for the circumgalactic medium, a combination of inflowing pristine gas from the intergalactic medium and out-flowing metal rich gas from supernovae and other high-energy events. NASA’s Wallops Flight Facility in Virginia manages the agency’s scientific balloon flight program with 10 to 15 flights each year from launch sites worldwide. Northrop Grumman, which operates NASA’s Columbia Scientific Balloon Facility in Palestine, Texas, provides mission planning, engineering services and field operations for NASA’s scientific balloon program. The CSBF team has launched more than 1,700 scientific balloons in the over 35 years of operation. 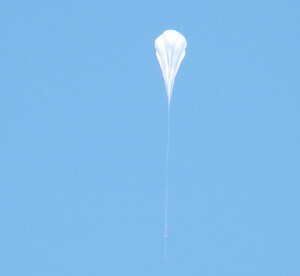 Raven Aerostar provides fabrication of NASA’s stratospheric balloons. For more information on NASA’s Balloon Program, visit www.nasa.gov/scientificballoons.